I am often being asked to host guest blogs, please find below one from Lindsey Wright, who writes usually for the education resource OnlineSchool.org. Please do feel free to post a comment from Lindsey's post. Technology has become a large part of teaching and classrooms in the U.K. are no exception to this trend. In fact, statistics show that teachers are looking for even more ways to give students hands-on experience with a variety of technologies. As the world around students today increasingly requires that they be familiar with and able to expertly use a vast array of electronic innovations, it will become more and more important to expose them to these concepts at a younger age. Though it may not be a chief consideration on the surface, or at an online school, the arrangement of technology in the classroom can go a long way toward either hindering or enhancing the students’ learning experiences. Electronic equipment should be placed where it will be accessible, yet will not necessarily disturb the flow of traffic. Essentially, teachers should take care to ensure that children will not be tripping over cords or other equipment as they enter, leave, and move around the area. Depending upon the age of the children in class, it may be advisable to ensure that students do not have direct access to electrical outlets or will not make accidental contact with outlets. Before positioning new technology in the classroom, consider other activities that may take place in the area. Eating and drinking usually do not mix well with technology in the classroom. A single careless spill can damage components irreparably and the school may not have the budget to replace them. Also carefully consider the lighting when placing technology in a particular room. The light from windows can cause glare on the computer screen, making it difficult to see. Flickering overhead lights can also be a detriment to utilizing technology. As such, make sure any flickering bulbs are replaced and that equipment is not placed too near windows or that the windows can be covered at appropriate times. It is also important to keep ergonomics in mind when arranging technology in the classroom. Any equipment purchased should allow for reasonable accommodation of students of varying sizes. Chairs should be at least minimally adjustable to allow all students to use the technology with comfort. This discourages fidgeting and allows the student to focus on the lesson, rather than trying to find a more comfortable position. One of the most important components of in-classroom technology is the teacher’s computer. This is the instrument through which instruction will take place. 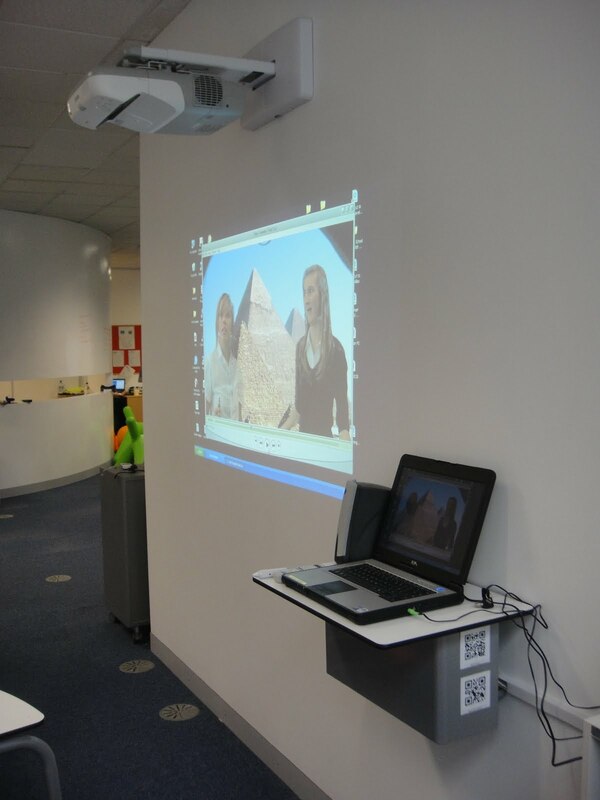 It is generally best if this terminal is placed front and center in the classroom space and that this computer features a means of projecting the work being performed for all of the class to see. Ideally, each student will also have his own work station. However, budgetary concerns sometimes make this difficult. Should students be required to share a work station it is important that each student be granted equal time to complete assignments. Instructors must carefully observe whether a particular student monopolizes a terminal to the detriment of another student. Always provide a firm reminder about the need for each student to have equal time with the technology. When students share a workstation there should be adequate seating for two or three students. Such an arrangement will encourage collaboration and good social skills while students are also learning to use new technologies. Computers used by students should be kept neat and tidy with all cords and wires kept well out of the way. This keeps the desk areas organized and less chaotic. Time and again many teachers have discovered the value of having a well-organized classroom, which promotes efficiency and minimizes distraction. However, when dealing with computers it is not only the physical environment of the computer that should be kept clutter free. The computer desktop should also be kept clear of any extraneous aliases or shortcuts that have been created either inadvertently or intentionally. Much like having an organized classroom, having an organized computer desktop makes it easier to navigate computer programs and encourages students to utilize class time wisely. A regular sweep of all computers to check for viruses and other potentially harmful programs should also be conducted to keep technology operating at its maximum capacity. In addition to class computers, teachers should think carefully about where they position other classroom technology. For instance, the BBC recently reported on the usage of electronic whiteboards in classrooms across the nation. These devices are generally best located in the front of the classroom. This ensures that students will attend to whatever is being displayed. Although some teachers mainly use the whiteboard as a means for displaying PowerPoint presentations, it is the teachers who find more creative and interactive ways of using the technology whose students really benefit from use of the whiteboard. When students can truly engage with the technology in the classroom, real familiarity and expertise develop and the student is even better prepared to meet the challenges of life beyond the classroom. Regardless of technological glitches that may cause the occasional difficulty with conducting class as planned, electronic devices are largely an asset to teaching. When a classroom is thoughtfully configured to allow each student equal time with the classroom’s technology, students are presented with the opportunity to quickly expand their knowledge base. For optimum learning, the devices should always be kept in a tidy and organized fashion to promote efficiency and eliminate distractions. It is also best if each student can be allotted their own technological device as this will allow for the best usage of class time. However, even if some devices must be shared, the prevalence of technology outside of the classroom makes its presence in the classroom absolutely indispensable.